Mile Markers: Was That The BoggsMobile Being Towed? Yep, I am afraid you saw that picture correctly. 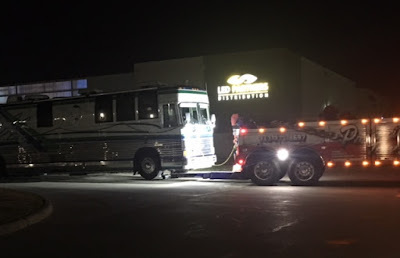 Towing a 1995 Prevost XL in Houston, Texas Where, oh, where do I begin? I suppose the best place to start would be the beginning. We know that in the beginning God created the Heaven and the earth, but I will fast forward about 6000 years skipping everything until after church this past Wednesday night. That is a good place to start the story. The great folks at the House of Prayer helped us load up the sound equipment after church and soon we were on the road, headed south through Dallas. We love the Dallas/Ft. Worth area but it is best driven through at night if at all possible when driving the bus. We slid through with no problems or delays at all. We drove about 250 miles to a Walmart in Huntsville, Texas. It was the third stopping option for us. Two rest areas before the Walmart were slammed full with trucks. We were barely even able to drive through one of them. Walmart had a nice open spot. We spent part of the day Thursday on bookwork for the ministry. We are not near done, but we are started. I kept an eye on Houston traffic and once it cleared from rush hour, we pulled out of Walmart and pointed south. If we hit traffic right, we were only 3 hours from Sweeny so we were fully expecting an easy night. About 42 miles into the trip I realized suddenly the bus had no power. It had probably died but we were going down the road at 60 MPH and I did not know the engine had shut down. We really can not hear the engine 45 feet behind us with the road noise and traffic. I lifted my foot from the accelerator and pushed again and no power. 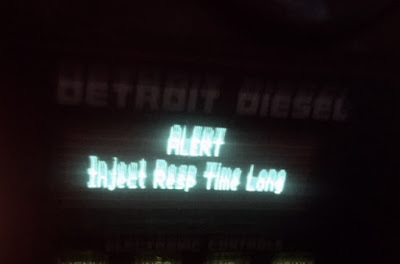 I scanned my gauges and warning lights and nothing was out of normal until this alert popped up on the Detroit Diesel monitor. I interpret that to be Injector Response Time Long. We were in the third lane of five so I started working my way over to the right shoulder. And there we were from 9:00 PM until after 1:00 AM. Kelly Jo and Odie began to text some family and friends to pray and I text Jeff Rowe. He guided me through what to do over the coming hours. Jeff's steady hand and bus knowledge is always a plus for me and the girls. I am so thankful he still takes my calls. My first call was to Prevost Action Service, which is a 24-hour helpline for Prevost owners and drivers. 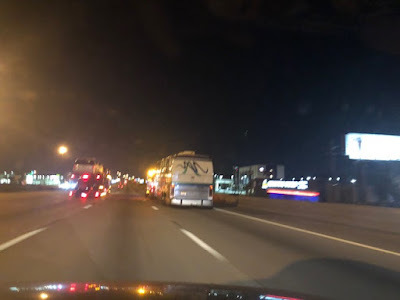 After lots of connections and back and forth conversations, they found there was no one in the Houston area that could send a roadside mechanic until morning and the best option was to tow the bus. I sincerely wanted to avoid a tow hook. I have dreaded seeing the BoggsMobile on a hook and have prayed fervently for every bus and owner I have ever seen broke down or being towed. The only other option was spending the night alongside the busy interstate and that was not an option we considered for one moment. Prevost recommended Priority Towing and they arrived at 12:06. This was not the driver's first big job and I was so glad to see that. Brandon was professional, courteous and more than up to the task. You can not tow something this big without removing the drive shaft or an axle. Once Brandon had it set on the hook, he took out the axle on the passenger side and we were ready to go. Removing the drive axle on a 1995 Prevost XL The bus needs a good supply of air to keep the brakes from activating and so the tag axle keeps the bus as high as possible. He ran an air hose to the rear of the bus, plugged it in and away we went. We were on the road by 1:10. 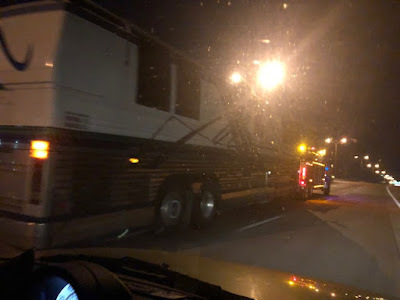 We were parked at Prevost Houston, disconnected from the tow truck, settled up with the tow company and going inside the bus by 2:20. Our night was a much longer night than we anticipated and we did not make it all the way to Sweeny, but we were praising God for His protection and guidance. Things could have been much worse. We are still praising Him! I was up at 7:00 when Prevost opened Friday and they were expecting me. They told me upfront that they would probably have to bring in a third party Detroit engine guy to work on the bus. Prevost has put Volvo engines in their buses for seven or eight years so they no longer offer support of Detroit engines or train their mechanics on them. I could have been towed to a Detroit specialist, but we could not reach any Thursday night to see if they could get me in any time soon. I am thankful Prevost Houston was willing to receive the bus Thursday night. Prevost did try to read the codes on the engine Friday morning, but had no luck. The alert I showed you above, Injector Response Time Long, often indicates a problem with the wiring harness from the computer to the injectors. Kelly and I tried to look at the harness closely but could not do much without getting under the bus. Hopefully, the Detroit guy will be here today, read the codes and find/fix the problem quickly and reasonably. I know that many folks are already praying for us and we feel it. Surprisingly, I have been able to take this with almost complete calm. The Lord has helped me and certainly continues to help me even now. Please keep praying. Pastor Scott Morris and Bro. Brad Nicholson were ready to jump in the truck and drive from Mississippi to help me. I appreciate that very much. It was a great comfort to me in addition to the information Bro. Brad was able to give me. Thank you, brothers. Late Friday morning the guys from Prevost pushed the bus forward and then back into the next spot over so it could be locked up securely over the weekend. We have owned this bus nearly 11 years and driven about 170,000 miles across this country many times and this was the first time we had it towed. It now has 350,266 miles plus about 20 miles behind a tow truck. That is not bad at all! If this bus makes it 350,000 more miles before the next tow, I should be in Heaven a long time before that! At the current rate, the next tow will be 22 years away. I am on the bus at Prevost Houston now hoping and praying that the mechanic comes today and brings a bucket full of knowledge, talent, skill, ingenuity and a helpful attitude. Hey, it does not hurt to ask big, right? We began revival Friday night, but I will give you the rest of the weekend report tomorrow. Thank you for tuning in today.